Students identify strategies writers use when revising, and they evaluate how revising can improve their writing. Students practice applying the following revision skills: adding, deleting, and moving sentences for clarity; using transition words for cohesion; combining sentences and using a variety of sentence lengths; and improving word choice for vivid writing. 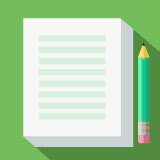 In this experience, students identify strategies writers use when revising, and they evaluate how revising can improve their writing. Students practice applying the following revision skills: adding, deleting, and moving sentences for clarity; using transition words for cohesion; combining sentences and using a variety of sentence lengths; and improving word choice for vivid writing. Explain why revising is important to the writing process. Identify and apply common revision strategies. As a writer, your goal is to communicate your ideas to your reader. To do this well, you want to make sure your thoughts and ideas are clear and that your sentences flow smoothly and logically from one idea to another. Rarely do writers get everything right the first time they write. During the revising step of the writing process, you can make changes to improve your writing and ideas. In this experience, you will identify strategies to use during the revision process. You will practice these strategies and evaluate how they help you improve your writing. If you could plan your perfect day, how would it look? Draw a picture that shows your idea of a perfect day. Take another look at your picture. Is there anything you want to change? Briefly describe what changes you would make to your illustration. Explain why these changes would make your picture better. Students will likely identify changes that allow them to make a clearer, more complete picture. Just as you can make revisions to your drawing to express your ideas better, writers can make revisions in their text to improve their writing.